Folks - I'm handling the Monte Carlo fire from NYC, where I'm on vacation. If you are in Vegas and/or have a Monte Carlo story, please EMAIL ME as soon as possible. I'll need a # to call you back at so we can talk. Remember the thrill I got last year when one of my stories became a joke on NPR's "Wait Wait Don't Tell Me"? Well, here's another one: I just got 149 points on one Scrabble move. Many of you know I'm a bit of a computer Scrabble nut. I don't play Scrabulous, the Indian site that could be offline by the time you read this because Mattel and Hasbro are after them. 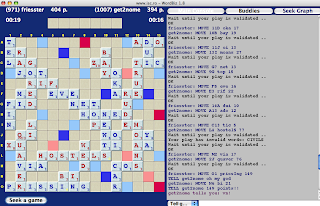 Instead, I found something called the Internet Scrabble Club, or ISC, and for a few years now Miles and I have played. Don't know why the companies aren't after them except that ISC is nonprofit and there's no advertising or fees. Who knows, we may be next. This is actually the completed board after the game was over. 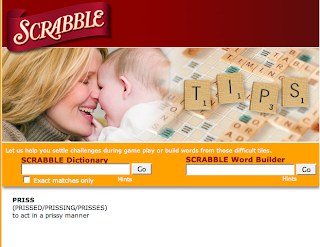 I was wondering what exactly PRISSING meant, so I went to Scrabble.Com to look it up. It turns out to be, duh, the act of acting prissy." But I figured I'd provide that screenshot, too, since I've always wondered what a woman and a baby had to do with Scrabble. In case you're curious, the known record for the most points in a single Scrabble move was QUIXOTRY, which landed a fellow in Lexington, Mass., a whopping 365 points en route to a record game score of 830. Read that fascinating tale (no, really, I found it fascinating!) by Stefan Fatsis here on Slate.Com. "The Strip" is LIVE tonight - with Sheldon! Join us tonight for extended excerpts from my 2-hour chat with the third richest American! Hear him talk about Steve Wynn, his legacy... and bowling! Come on down at LVRocks.Com at 7 pm PT! Or wait till the podcast.